Photograph 1 - Hoover Dam, Nevada (actually on the border with Arizona). Photograph 2 - Our newest rental a Chrysler Convertable taken at Hoover Dam with the new Memorial Bypass Bridge in the background. 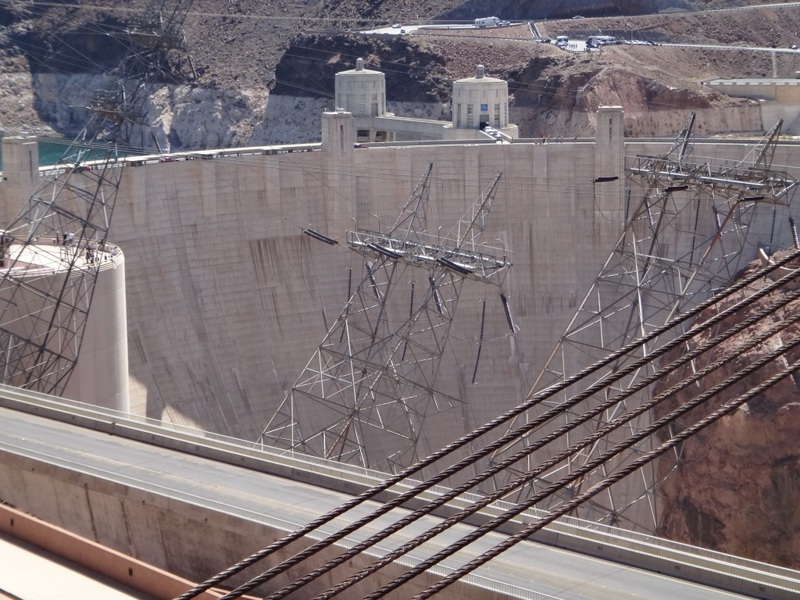 Photograph 3 - Panorama shot of Lake Mead taken from Hoover Dam. Photograph 4 - The wall explains it well. 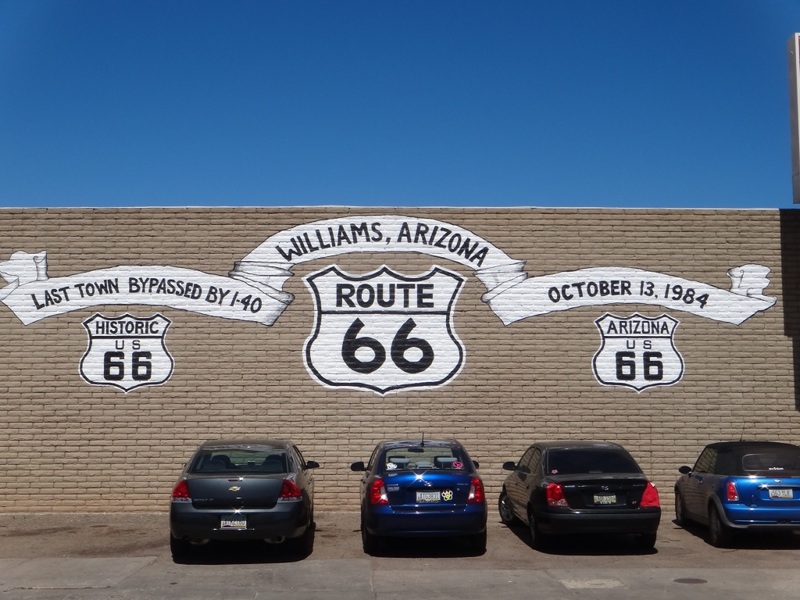 Taken at Williams, Arizona - Route 66 is for those oldies who had travelled the famous road. 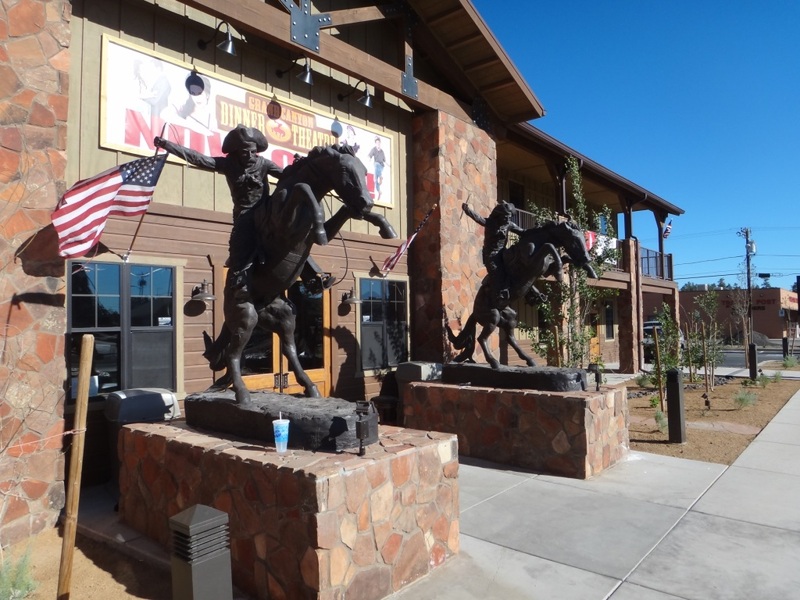 Photograph 5 - Statues of Pony Express Riders, taken at Tusayan near the Grand Canyon South Rim, Arizona. Our holiday so far in the US are disappointmnents and achievements. Most disappointments have been resolved and little has been deviated from our plans and arrangements. When we rely on companies and tour organisations we normally come to a "log jam". Pre-planned tours witrh tour companies can vary and may cancel at the last minute which is frustrating but when it comes to airlines, you are in their hands once you have checked-in. US Airlines was appraised yesterday and we will not regurgitate that issue again but today when we collected our vehicle from Budget another problem appeared - this time by us. We wanted to update our vehicle from a Ford Focus equivalent to a Mustang. Also we noticed that Budget and most rental companies will not allow you to take their vehicles out of the Nevada, California, Arizona, Utah states - something about insurance???? They methodically went through our confirmation documentation and couldn't see any such fine print and after 90 minutes or so they found a good resolution - at a cost of course. The manager at Budget (whose first name is Roosevelt) arranged with their sister company Avis to give us a Chrysler Convertable - yes said us. But.......the cost is twice the amount of your original car ($24USD a day to $45USD a day). Apparently this class of vehicle is actually $54USD a day and they were giving us a discount - wow. After some quick thinking we told them it was too dear and the manager from Avis said she did not want to loose us as customers and offered us the convertable for half the cost. 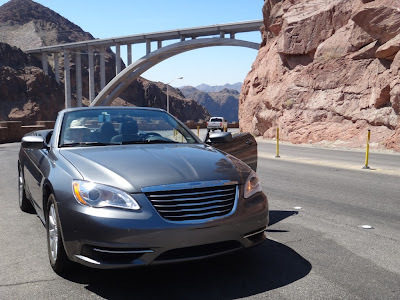 We took the offer....so now we have a grey coloured convertable and drove it out of Las Vegas with the top off and hence drove it to Hoover Dam. Too hot you may ask....yes...Anne was starting to get wind burn and we put the top back on and finished our day's driving with air-conditioning on full blast. For the next 32 days we will only take the top off when we are travelling short distances and in cooler climate. Or, in the early morning or late afternoon. Interestingly, the best way to take our bags out of the car is with the top off! From Las Vegas we drive to Hoover Dam and Lake Mead. We checked this famous attraction out this time at ground level instead of from a helicopter view. From there we entered Arizona and had lunch at Kingsman and onto Williams. 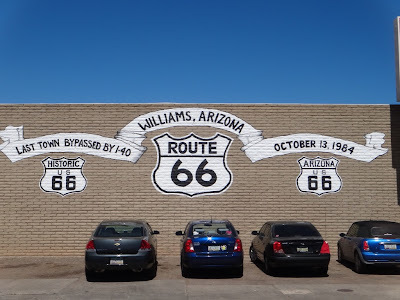 As you can see in the above photo Williams is one of the Route 66 towns. There were many bikies in this town enjoying the nostalgia of the famous road. From Williams we turned north to Tusayan the village outside the Grand Canyon South Rim National Park. We are now staying at a Holiday Inn establishment (one of the best motel chains in America in our opinion) for two nights. We purchased a weekly entry pass for the Grand Canyon which we will visit tomorrow. So...that's it for today - until tomorrow - cheers.